Called 'A Missile with a Man in it', the F-104 was developed as an interceptor, an aircraft who's sole mission was to get to the enemy planes (as in bombers) as fast as possible so that they could shoot them down before they reached their target. To that end, Lockheed designed the smallest airframe that they could fit around the J-79 turbojet. A thin, rocket shaped fuselage, short, stubby wings, and a nose section big enough to hold a pilot, radios and a 20mm cannon. They succeeded brilliantly, however, it took a pilot of above average skill to pilot this one as it had a very high landing speed and was not a plane you could toss around the sky. It equipped basically one wing at George AFB and eventually several ANG squadrons with the US. It was NATO and Japan who were left to further develop the Starfighter, eventually making it into a fighter-bomber. Despite the real lack of USAF use, the Starfighter was built in quite large numbers in Italy, Japan and via a consortium in Europe. Used by well over a dozen countries, the last F-104 was retired just a few years ago when the Italian F-104S/ASA version was retired. When I got back into model building in the early 1970s, it was with kits like this that poured my renewed interest. 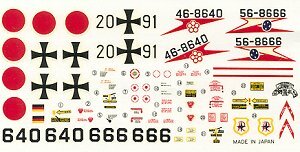 These kits were 300 yen in Japan during then and that was about a buck US, so I was able to buy a lot of kits on my pitiful USN paycheck. They were boxed exactly like this one, but without the word 'Minicraft' on them and the instructions had no English in them at all. To look at the kit, one is first struck as to how nicely it is molded. Yeah, it has raised panel lines, a definite lack of detail in the cockpit area (like a tub and a pilot figure) and by modern standards, this isn't what we are looking for. Even the one piece canopy has the raised frame lines on the inside! I can only guess that it was in vogue back then to paint these on the inside. However, to its credit, you get four sets of drop tanks, a centerline camera pod and missile rails with Sidewinders (crude though they be). You also get ejector pin marks galore, sink areas on some of the thick bits and a rather simplified landing gear. Speed brakes are separate and can be posed open, but there is no speed brake well, only an open area in the fuselage. Since this is a Minicraft imported kit, the instructions are in English and provide six construction steps plus a write-up to go with them. Painting info is given for things that need to be painted during construction. Generic names for the paints, of course as Hasegawa hadn't hooked up with Gunze as of yet. Markings are provided for three planes. One is a camouflaged German F-104G from JG 71 'Richtofen' in Dark Green/Dark Grey over Light Grey (which really should be Silver, if I'm not mistaken). The other two are from Japanese units that are not named and are both in overall light grey, FS 16376. These planes were based in Okinawa where there was problems with salt air corrosion due the base's nearness to the ocean. Most home island units were in bare metal, and really, you could do both of these in that manner if you wanted and you wouldn't be wrong. The upper wings on the Japanese planes are white. Decals are well printed, thick, and will go on without a problem, despite being about 30 years old. Well, this isn't a kit that most of us will go out and seek. However, if you are looking for a relatively hassle free build and you don't care if it ever sees a contest, you might want to look into picking this up. I'm sure your kids will like it if they are old enough to glue. Hasegawa has kept many of these dinosaurs in its catalogue. 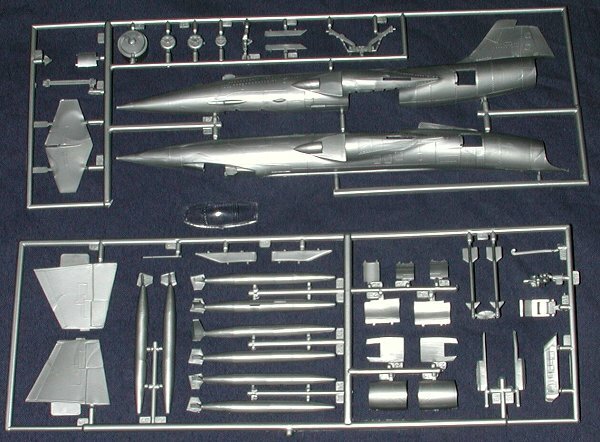 If you see a new Hasegawa F-104 for what seems like a rather low price, then it could well be this one! Review kit courtesy of your editor.